Note: This product is only available for orders shipped to the United States, except when included in our construction time lapse packs. Features 4K30, 2.7K60 and 1080p120 video, 12MP photos up to 30 frames per second, built-in Wi-Fi and Bluetooth®, and Protune™ for photos and video. Waterproof to 33’ (10m). With resolutions of 4K30, 2.7K60, 1080p120 and 720p240 for crisp, smooth footage. Captures an expansive field of view for stunning videos and photos. Ultrawide, medium and narrow field-of-view options allow you to select your perspective. Offers cinema-quality capture of photos and videos, as well as manual control over color, ISO limit, exposure and other settings. HiLight Tag makes it easy to identify video highlights to simplify playback, editing and sharing. Enable customization of exposure settings for nighttime time lapse photos. Auto low-light setting adjusts frame rates to optimize performance in low-light conditions. Allows you to take stunning photographs. Burst shooting up to 30 fps. Allows you to turn the camera on and begin recording with the push of a single button. SuperView lets you record video with an immersive field of view. Allows you to capture long term time lapse footage with BlinkX. The camera is waterproof rated for use at depths of up to 33' without an additional housing, so you can capture your underwater adventures in stunning high-definition. Ensures flexible recording options and compatibility with most GoPro mounts (curved and flat adhesive mounts included). Records crisp, clear sound with minimal distortion and a high dynamic range. Supports select cards for expansive storage capabilities (card not included). Offer enhanced connectivity to the GoPro app (download required), as well as a range of accessories (not included). The GoPro HERO5 Black camera is compatible with these CamDo Solutions Products. Our X-Band Motion Sensor is an accessory for Blink or BlinkX that uses doppler detection to determine if motion has occurred by bouncing 10.5 GHz microwave signals off the objects in front of it. Motion detection can be used for security camera applications, wildlife photography, and for recording events where a person or other object, such as a car or truck, moves past the camera from time to time. The X-Band Motion Sensor does not work underwater. Our X-Band Motion Sensor is an active device powered by BlinkX/Blink’s 3.5mm Port2 connection, which bounces 10.5Ghz microwave signals to determine if motion has occurred. Microwaves do not rely on heat so the moving object does not need to be warm to trigger the sensor. Microwaves will also pass through glass and plastic, so the X-Band sensor can be mounted behind a window or inside an opaque waterproof box for use outdoors. The range of the X-Band sensor is adjustable from 8 to 30 feet (2-10m). Actual distances will depend on the environment and mounting configurations. The X-Band Sensor is typically used with our durable weatherproof SolarX or DryX enclosures that have enough space to house the GoPro, BlinkX/Blink, Motion Sensor, and Battery Packs. Blink and BlinkX are designed to extend the GoPro camera's battery life by turning the camera off between triggers and allows for motion detection triggering to be set on a scheduled active time to ensure footage is only captured when needed. In power saving mode, since the camera needs to power on before starting the recording, there is approximately a 5 second delay between when the Motion Sensor is triggered and when the recording starts or the picture is taken. Where power is less of a concern Blink has a "fast capture" mode (currently in Beta for firmware v2.00) where the camera will continue to stay on during the active motion detection schedule to reduce the activation time to less than 1 second. The camera will remain off when no motion detection schedule is active. Microwaves do not rely on radiated heat from the object, it is well suited for detecting smaller wildlife as well as larger objects. It is also less prone to false triggers caused by moving sunlight, etc. 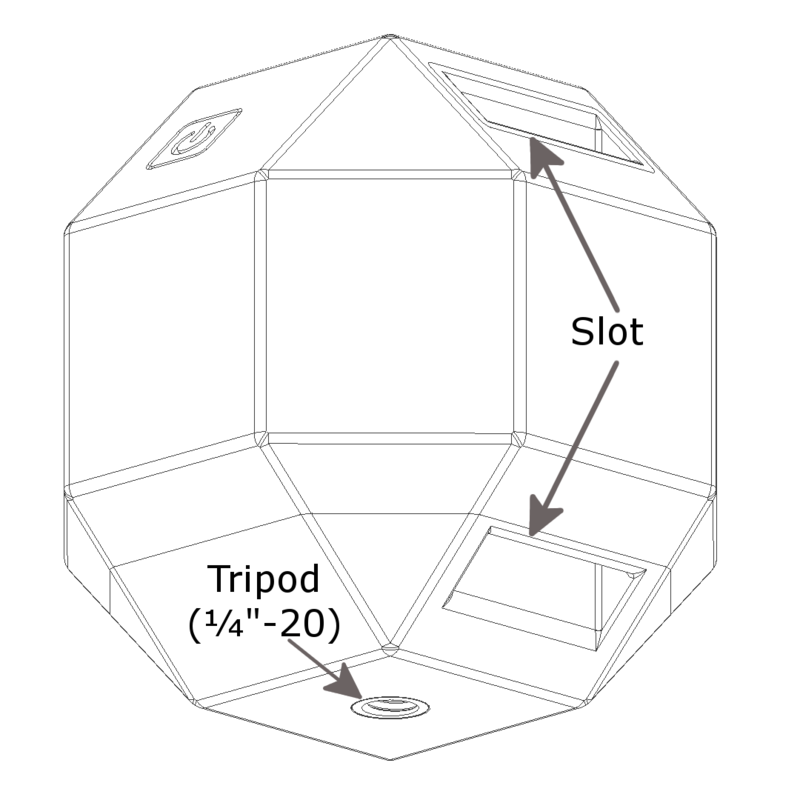 Microwaves will pass through glass and plastic, but not metals, so the X-Band detector can be mounted inside a window, or in a weatherproof box for use outdoors. Capture single shot, multiple stills, or video. Trigger the camera between capturing regular interval time lapse images. The X-Band Motion Sensor is powered from Blink. It uses very little power and does not alter the battery life significantly. Detection Range: adjustable from 8 to 30 feet (2-10m). Actual distances will depend on the environment and mounting configurations. Dimensions: 1.8” x 1.6" x 0.5" (46mm x 41mm x 13mm) and mounts neatly inside our SolarX or DryX enclosures. Mounts: Velcro tape, set of 1/8" (3.175mm) through holes spaced at 1.5" (38mm). The X-Band Microwave Motion Sensor is an accessory that can be combined with Blink or BlinkX to trigger the GoPro camera when motion has occurred. Do I require Blink or BlinkX to use the X-Band Motion Sensor? Blink or BlinkX is required to use the X-Band Microwave Motion Sensor accessory to trigger the GoPro camera when motion is detected. How does the Motion Detection video recording time work if motion is detected more than once in the interval? If the video mode is selected in the Motion Detector interface of Blink/BlinkX, the camera will continue to record for the amount of time set in the Video recording menu once motion is no longer detected. If movement is detected before the recording time elapses, the recording interval will be reset to ensure you capture the entire motion event. How does the X-Band detect motion? The X-Band sensor uses doppler detection of microwaves bounced off the object and is triggered by motion towards or away from the sensor. Microwaves pass through opaque plastics and glass, but not metal. The moving object does not need to be warm to trigger the sensor. Will the X-Band Sensor work underwater if contained in a waterproof housing? No. The X-Band Sensor only works in air and will not work underwater. Can I use more than one sensor with Blink or BlinkX simultaneously? No. Blink and BlinkX detect pulse frequency from the X-Band Sensor, so only one sensor can be used at a time. Does the controller board fit inside the standard waterproof case? BlinkX does not fit into any of the standard GoPro housings. Blink fits in the extended BacPac backdoor attachments included in the GoPro Backdoor Kit and provided with the GoPro accessories such as the GoPro Dive Housing, GoPro LCD BacPac or the GoPro Battery BacPac. However, since the Motion Sensor plugs into the 3.5mm port on the bottom of Blink, a small hole needs to be drilled into the housing to allow the sensor’s wires to pass through the housing. X-Band detectors are normally used with our outdoor SolarX and DryX enclosures. CamDo offers a series of Outdoor Weather Resistant Enclosures designed to house the GoPro camera, Blink, and Motion Sensor along with space for a high capacity battery and optional solar panel for longer term deployment. The X-Band detector fits inside the weather resistant case and does not require any hole in the case for installation of the X-Band Sensor. Can a Blink or BlinkX motion detection schedule and time lapse schedules overlap? Yes, the motion detection can be set on a schedule that overlaps with a time lapse schedule. If the camera enters a time lapse interval while camera is currently recording in motion detection mode, the time lapse image will be skipped. If the camera is currently taking a time lapse image when motion is detected, Blink will re-trigger the camera on the motion detection schedule after the camera has taken the time lapse photo and turned off. I am a hacker. Can I use the ports on the Blink or BlinkX board to trigger the camera using other devices? The motion detection Port2 of Blink and BlinkX can be programmed to accept an external input to trigger an action. Unlike the X-Band operation which requires a set amount of pulses within a certain timeframe, PIR/External mode only requires a pulse for more than 250ms to trigger the camera. See this blog post for more details. I am a not a hacker. I have an idea for a project for our organization. Can you help? Yes. Our controller boards were originally designed to handle custom projects we built for scientists and professional photographers. Our controllers are very flexible and can be reprogrammed to respond to different kinds of control inputs. Some controllers also have an output which can be used to control lighting, or give different types of feedback. Contact us for a quote for your application. A purpose built time lapse camera. Remote monitoring and easy time lapse! ShootX is a purpose-built WiFi enabled time lapse camera with the option for automatic upload of images via the CamDo cloudX platform. ShootX has multiple mounting connections and features a 120° wide angle lens to capture 2.6K resolution images. ShootX can be programmed for a single interval that repeats continuously. For increased programming flexibility without image upload features, see our BlinkX for the GoPro HERO5 cameras. ShootX is designed for indoor use only and should not be used outdoors without protection from rain/humidity. cameraHow does it compare to other cameras? As can be seen from the graphics below, ShootX provides high quality 2.6K images and associated time lapse videos. It is significantly better than typical 1080 resolution and blows lower quality 720 cameras out of the water. If you need 4K footage, use our GoPro and BlinkX product offering. Get ShootX up and running in less than 2 minutes. Read the quick start guide here. The ultra-low power consumption allows for a battery life of over 3 months with typical default settings of 1 frame per 10 minutes (without CloudX). Couple ShootX with a Solar Panel Kit or connect to mains power via USB to run it indefinitely with CloudX features. Also, check out our Time Lapse Solutions page for more information on all the parts you need for those longer term projects. Deploy with internet connection to utilize cloudX features, such as automatic image uploads, remote status monitoring, daily status emails, and remote firmware updates. ShootX Mounting Kit - secure, repeatable mounting kit with all the pieces you need to mount your camera. Tripod mount (1/4"-20) - There are various compatible mounting brackets and magic arm brackets for the standard tripod screw. Strap slot - Using a steel strap like a pipe clamp is a very robust way of mounting the camera to a variety of post shapes. Note that in sub-freezing temperatures, the camera battery will not charge to prevent battery damage. In addition to not charging, the battery capacity will be reduced (this is a normal characteristic of lithium-ion batteries). We also don't recommend long term deployment at temperatures below freezing (0 degrees Celsius) due to potential damage to the internal camera battery. ShootX can connect to any 2.4GHz WiFi signal [802.11b/g/n] for internet access to utilize the optional cloudX features. What is the ShootX field of view? ShootX has a 120° wide angle lens that is focused from 60cm (2ft) to infinity. This provides a wide depth of field focusing everything in frame at least 60cm away from the lens. What image file format does ShootX use? ShootX outputs JPEG images with a configurable JPEG quality. Note that setting JPEG quality above 90 significantly increases file sizes and affects battery life. If battery life and memory capacity is important, we recommend retaining images quality at 90. The ideal shooting interval is normally determined by the length of the final time lapse video clip, capacity of the SD card or battery capacity available. Our Time Lapse Calculator can be used to help determine the ideal interval between photos as determined by these variables. Just select ShootX as your camera in the calculator. Can ShootX be programmed to only capture images between set times on specific days? Yes, ShootX can be programmed to take a shot at a regular interval between set times each day. You can't have a different schedule each day however. For greater programming flexibility, see our GoPro controllers; BlinkX for HERO5 Black and HERO5 Session, or Blink for HERO3+ and HERO4. How do I change the interval between ShootX's image triggers? The default interval between images is 10minutes. To adjust the interval, ShootX can be programmed from a web User Interface or connected to a PC or MAC via USB to edit the settings.ini file using a standard text editor (eg. NotePad). See the ShootX User Manual for additional instructions. Does ShootX have automatic image uploading via WiFi? Yes, ShootX can connect to a WiFi signal to automatically upload each image to our cloud platform cloudX. See our CloudX page and ShootX User Manual for additional information. What if I don't have a cloudX Pro subscription? The photos will be stored on the camera, which you can download locally to a computer. You won't have access to the online cloud platform including features such as automatic upload, remote status monitoring, email notifications, remote firmware updating, etc. Since the camera turns off between triggers to conserve power, Always On mode is important to prevent an external battery pack from automatically turning off due to periods of inactivity. Most of the USB battery packs on the market have an automatic power saving feature which turns off the battery if the battery is not constantly supplying power to a device. If the camera is turned off for more than a few minutes between triggers, the external battery might automatically shutdown due to inactivity. However, our V15 and V44 have two modes of operation, the standard Auto Off mode and an Always On mode. The Always On mode prevents the battery from automatically turning off when insufficient current is being drawn due to the camera being turned off to conserve power. How can I mount ShootX? ShootX has two options for mounting, a standard threaded tripod insert (1/4"-20) on the bottom of the camera, and a vertical slot (24mm x 4.8mm) at the back of the camera. We also have the ShootX mounting kit (see main tab). What are the dimensions of ShootX? ShootX is 75mm wide between each flat square surface and is 80mm wide between each of the flat triangular surfaces. ShootX weighs 300g. This compares to a GoPro HERO5 Black camera at 117g or the GoPro HERO5 Session at 74g. Remote monitoring and simple time lapse creation! CloudX is a state of the art online time lapse platform, allowing you to monitor your time lapse camera remotely. There is also flexibility in setting up multiple email addresses and a schedule of how often the daily status information should be emailed to you. In order to use this feature, Blink/BlinkX must be near a WiFi access point with an internet connection(either an open WiFi network or WPA secure network - WEP secure networks are older technology and not supported). If you have purchased the CamDo ShootX camera or UpShot (coming soon), you can also upload your images to the CloudX and get updated time lapse videos automatically created! account_circleSounds great, how do I get access? With every purchase of a compatible CamDo product (Blink, BlinkX, ShootX), you get two weeks free access to CloudX. All you need to do is enter your details into the user interface for your particular product (see the instructions for how to do this on our support pages here) and your free account will be automatically created. You will then automatically receive an email with your account details and how to login. Two weeks free is included with all compatible CamDo products so you can try it out. For the 12 month Pro Plan, get 12 months access and only pay for 11 months. If you need more frequent uploads or larger storage, please contact sales@cam-do.com for pricing. camera_enhanceWhat cameras can I use? ShootX - purpose-built timelapse camera from CamDo. Capture months on one charge or indefinitely with a small solar panel. Upload footage and heartbeat status information. One button operation. Auto time-lapse generation. Blink and BlinkX - time-lapse controllers for GoPro cameras. Upload heartbeat status information and receive daily emails. Login to the platform at any time to view recent camera status. insert_chart AI - Coming Soon! Analytics to count objects and generate reports about trends and changes. Need to count cars, bulldozers, people or other objects? Will BlinkX ever have the upload feature? No, however, we have a new product called UpShot that will be released in Q4 2018. Can I change the settings of the camera remotely? No, only update the firmware. This is likely to be a future feature.